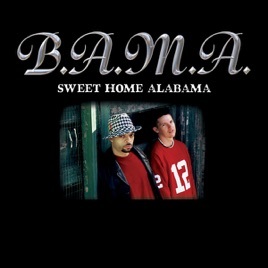 Sweet Home Alabama - Single B.A.M.A. ℗ 2004 Universal Records a division of UMG Recordings Inc. I can't listen to this song often enough, and I can't help but jam when I hear it! I even have my 2 year old daughter rockin' out to it! We tell her to do "the head dance" when we play this song - it's so cute! I just wish I could find the lyrics somewhere because it's the kind of song that you just have to "sing" (or rap) along with. I look forward to hearing more tunes from these guys.